Certified according to European Standard EN 1176 by the German TÜV - SÜD. 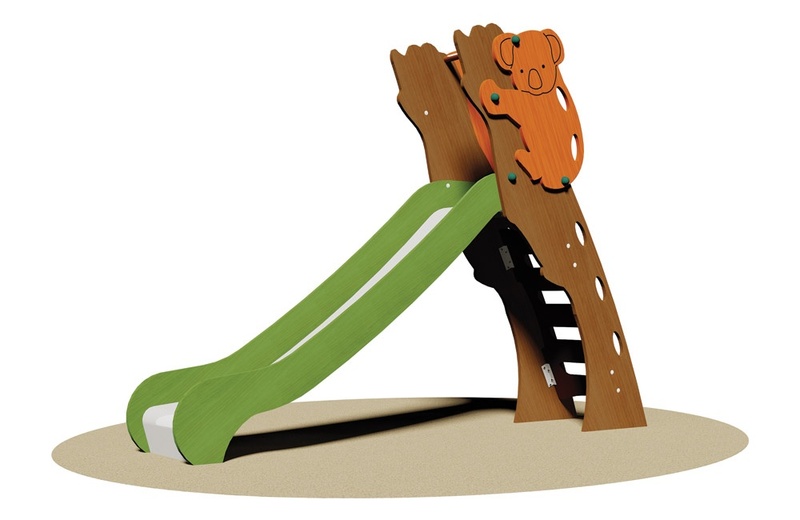 Structure made in multi-layer okoume plywood mahogany glued with phenol formaldehyde resin without sharp edges and finished with a coloured overlay film and treated with colored impregnating agent and non-toxic paint, wax-based water-soluble. Components: N°1 access stair with N°2 lateral support panels in multi-layer okoume plywood mahogany, mm 19 thick, connected to the stair’s panel in multi-layer birch wood glued with phenol formaldehyde resin with non-slip knurled surface and finished with a coloured overlay film; N°2 coloured lateral panels in multi-layer okoume plywood mahogany representing a Koala, mm 15 thick; N°1 slide H cm 98 in aluminium 20/10 folded under pressure and edges in multi-layer okoume plywood mahogany, mm 19 thick. Assembly system with 8.8 galvanized steel bolts and self- locking nuts. Coloured nylon cap nuts as required by law. Hot-dip galvanised metal brackets for ground anchoring system.